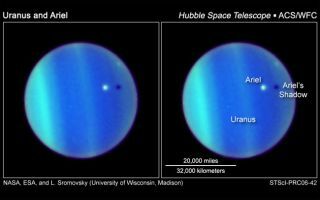 The shadow cast by a moon as it drifted through space above the blue-green cloudtops of Uranus was recentlycaptured for the first time by NASA's Hubble Space Telescope. To anobserver on Uranus, the passage of the planet's icy moon Arielwould have appeared as a solar eclipseand the Sun would be completely blottedout. However, the effect would not be nearly as dramatic as a total eclipseinvolving Earth and its moon. The Sun appears much smaller on Uranus than onEarth because the giant planet is located much further away. Therefore, a totaleclipse involving its moon completely blocks out not only the Sun's body, butalso its corona. Though such"transits" by moons across the disks of their planets are commonplacefor other gas giants like Jupiter,the satellites of Uranus orbit theplanet in such a way that they rarely cast shadows on the planet's surface. Themoons of Uranus orbit the planet above the equator, so their paths alignedge-on to the Sun only every 42 years. In orderfor a Uranian transit to occur, the Sun must shinedirectly over the giant planet's equator; the next time this will happen againis in 2007. The last time such a Uranian equinoxoccurred was in 1965, but telescopes at the time were not sharp enough to viewthe transits. Named aftera mischievous airy spirit in Shakespeare's "The Tempest," Ariel isonly one-third the size of Earth's moon.The moon is the nearest large satellite to Uranus. As Uranusapproaches equinox, there will be additional eclipses by its large moons Umbriel, Titania, Oberon, as wellas manysmaller moons. Because ourmoon is moving slowly away, it is only at this moment in geologic history thata totaleclipse can happen on Earth.Millions of years from now, our moon will be too small in the sky to completelyblock out the Sun.